In the library universe, I see a lot of debate about whether to keep buying print reference sources or just do away with paper completely and move to online reference. I definitely understand the reasons for getting rid of print reference sources. It saves paper and shelf space, online sources update more frequently than print, and in most cases you can access more information online. But I still think having print reference materials in a library collection is important, in an elementary school at least. I’m teaching basic research skills to the 4th graders, and I’m starting with print and moving online as the year progresses. For a lot of the introductory lessons (Introduction to Atlases, Intro to Almanacs, Intro to Encyclopedias, etc. ), I give students a class period to work in teams and just look at the books. They write down 10 interesting facts they learned, or things they didn’t know would be in these books. Now, I’m dealing with kids who for the most part have no idea what an encyclopedia is. They are part of the Google generation, and they are used to instant information from (sometimes) questionable sources. Watching them browse through the print resources and have Aha! moments as they really learn and absorb the information in the books tells me that print is still important in elementary grades when kids are just starting to learn about fact finding and research. Will I be buying a new print encyclopedia every year? Absolutely not. I’ll be focusing on resources they use and enjoy. Will I be setting them loose on the wealth of information offered by the internet, and will I teach them how to evaluate the information they find there? Absolutely. But the browsing factor that books give them is, I think, important for their developing skills. Some of my kids are overwhelmed by online information. Last week I had them work in pairs to look up a kind of reptile. I gave each pair the print volume of the encyclopedia they needed for their creature and had them sit at the computers and look at World Book Online (which we subscribe to). Their task was to compare the experience of finding their reptile in the book and online. A lot of them thought the information online was better, but they preferred the experience of looking it up in the book. They instinctively understand more about the way books are organized, and I thought that was really interesting. I wasn’t expecting that from this generation of kids, who have grown up so immersed in online culture. But I guess as long as their school textbooks are in print, that’s what they will have the most exposure to. I think they just need more training and more context to become proficient online information-seekers, and hopefully I’ll get them there by starting with print. 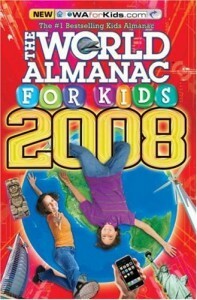 For example, my kids LOVE The World Almanac for Kids. Along with Guinness Book of Records, I have a lot of older kids who check these books out for pleasure reading. They love facts-small, easily digestible pieces of information. Especially the boys, many of whom don’t like to read fiction. I love giving them these books for fun because it only helps build their research skills. And they don’t even realize it. If they start by becoming thoroughly familiar with these books, when I put them in front of a computer to show them the online versions it suddenly becomes much easier for me to translate that fluency onto the computer. They have a context, they know how the information looks and reads from the book. So when I tell them this is the same information in a different format, they pick it up faster than if they started on the computer in the first place. 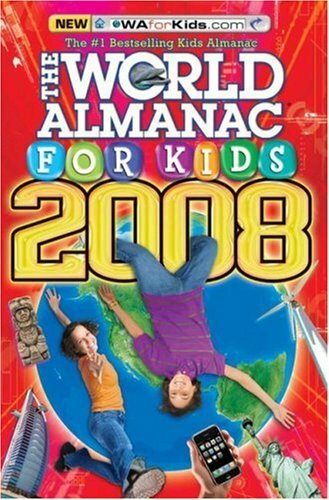 And that’s what I plan on doing with my kids this year (The World Almanac for Kids site is a great resource for hopping back and forth between online and print, by the way).